Of the five largest fast food corporations in the country—McDonald’s, Subway, Burger King, Taco Bell and Wendy’s—Wendy’s stands alone as the only one who has refused to join the Fair Food Program. Of the five largest fast food corporations in the country—McDonald’s, Subway, Burger King, Taco Bell (Yum! Brands), and Wendy’s—Wendy’s stands alone as the only one who has refused to join the Fair Food Program, a unique farmworker-driven initiative consisting of a wage increase supported by a price premium paid by corporate purchasers of Florida tomatoes, and a human-rights-based Code of Conduct, applicable throughout the Florida tomato industry. 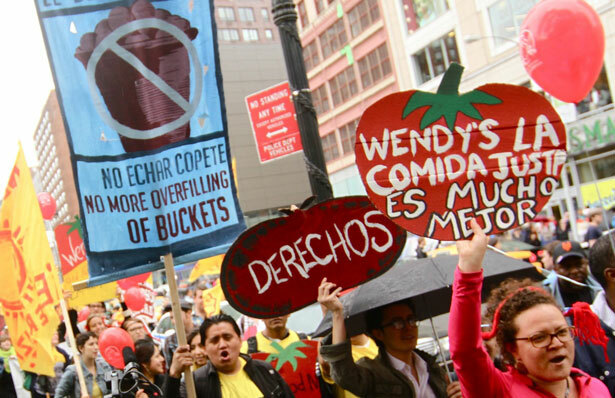 As Wendy’s positions itself to implement sustainable business practices and promote its sourcing of “honest ingredients,” it must realize that respect for human rights and worker participation are integral components of the genuine sustainability that today’s consumers expect and demand. That’s why the indefatigable Coalition for Immokolee Workers is staging a Wendy’s Week of Action, August 3 to 11. Join the movement calling on Wendy’s to join the Fair Food Program and find out how you can sign an open letter, call Wendy’s management, deliver info to Wendy’s franchises, educate your community about the issues and help spread the word about the campaign.